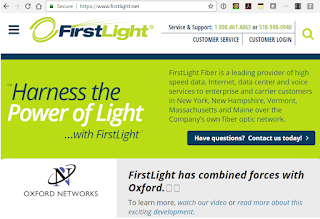 Antin Infrastructure Partners (Antin) agreed to acquire FirstLight, a leading fiber-optic bandwidth infrastructure services provider operating in the Northeast U.S., from Oak Hill Capital Partners IV. Financial terms of the transaction were not disclosed. Antin is a leading independent private equity firm focused on infrastructure investments. 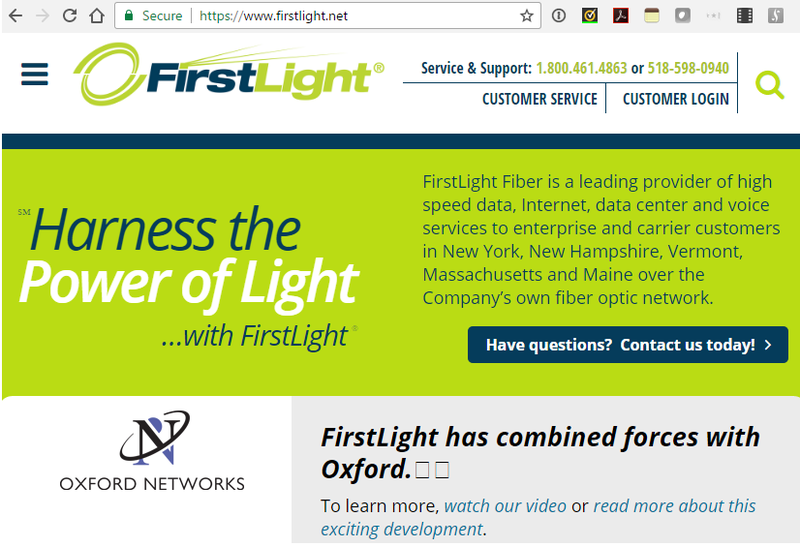 FirstLight originally started as an Albany, New York-focused fiber provider and expanded through the acquisitions of segTEL in New Hampshire and Maine; TelJet in Vermont; G4 Communications in New Hampshire; Oxford Networks in Maine and New Hampshire; Sovernet Communications in Vermont and New York; 186 Communications in New Hampshire, Massachusetts, and Vermont; and Finger Lakes Technologies Group in New York and Pennsylvania. "We have tremendous respect for all that FirstLight has accomplished to date. 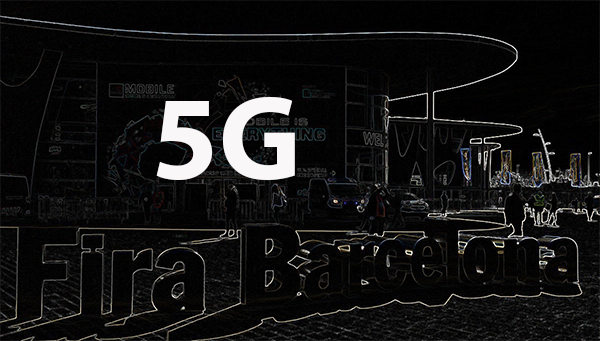 We are delighted to be backing Kurt Van Wagenen and his talented team to continue the company's growth strategy, leveraging the success that Antin has had with communications and fiber investments in Europe," said Kevin Genieser, Senior Partner at Antin. FiberLight will provide backhaul connectivity in the U.S.for Angola Cables. The partners will leverage the recently completed 10,556-km Monet cable linking Florida to Brazil, which is capable of delivering a minimum of 64 Tbps of capacity. Angola Cables operates two fiber optic pairs within the Monet cable system, one transmitting data from Fortaleza, Brazil to U.S. shores and the other carrying traffic to Sao Paulo, Brazil. Equinix’s MI1 is also known as the NAP of the Americas (NOTA) and is the key gateway for internet traffic between the U.S. and Brazil. 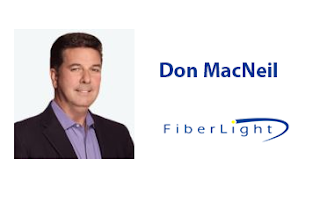 “As digital transformation continues to bring the world closer together, FiberLight has made it a priority to partner with international data carriers and establish presence within world-class subsea landing stations to ensure global communication and data transport activities benefit from access to reliable, high bandwidth fiber network capabilities,” said Don MacNeil, FiberLight’s CEO. Bosch, which is one of the world's leading suppliers of automotive subsystems, announced its entrance into the ridesharing business and its acquisition of Splitting Fares, a start-up based in Detroit that operates a platform that allows companies, universities, and municipal authorities to offer their workforces ridesharing services. Financial terms were not disclosed. The SPLT app connects people who share the same route to their place of work or study. 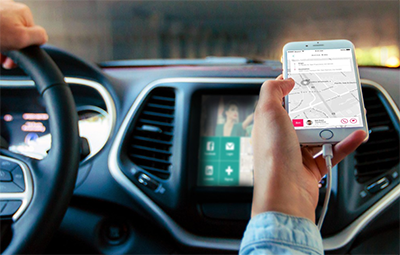 The app finds the best composition for the ride-share, and computes the fastest route. “Increasingly, smartphones are becoming the most important means of travel,” Heyn added. Connecting road users and modes of transportation is making flexible, multimodal mobility possible: in a matter of seconds, everyone can decide how they want to travel, and make the necessary bookings. “With this sustainable and affordable mobility service, we want to fundamentally change the way people get from A to B,” said Anya Babbitt, the co-founder and CEO of SPLT. Bosch said it is pursuing a range of IoT activities encompassing solutions for connected mobility, connected manufacturing, as well as for connected energy systems and buildings. Accedian has acquired Performance Vision, a company based in Paris that specializes in network and application performance management (NPM/APM). Financial terms were not disclosed. Accedian said Performance Vision’s exceptional wire data analytics complements its own SkyLIGHT active monitoring platform, bringing visibility of all applications, transactions, and network components together. The solution delivers actionable insight generated by analyzing all traffic crossing physical, virtual, cloud and SDN infrastructure. Accedian also announced two executive appointments: Sergio Bea joined the company as Vice President of Global Enterprise and Channels, while Richard Piasentin took the role of Chief Marketing Officer and Chief Strategy Officer. Broadcom trimmed its offer to acquire Qualcomm from $82 to $79 per share, but said it is still committed to pursuing the deal. The offer consists of $57 in cash and $22 in Broadcom shares. The decision to cut the price follows Qualcomm's decision to increase its offer to acquire NXP Semiconductor from $110 to $127.50 per share. Broadcom's proposed merger agreement otherwise remains unchanged, including the $8 billion regulatory reverse termination fee and 6% per annum (net of dividends) ticking fee accruing from and after the 12-month anniversary of the date of the merger agreement. 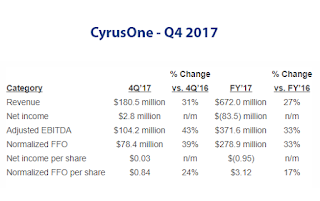 CyrusOne reported Q4 revenue of $180.5 million, compared to $137.4 million for the same period in 2016, an increase of 31%. The increase in revenue was driven primarily by a 49% increase in leased CSF and additional interconnection services. Q4 net income was $2.8 million, compared to net income of $0.8 million in the same period in 2016. “We had another very strong year signing $105 million in annualized revenue, increasing the size of our footprint by more than 50%, extending our presence to the Southeastern U.S. and Europe, developing a solution for our customers in China, and raising nearly $2.5 billion in the capital markets. We are very excited about this next phase of growth for the company as we expand internationally to help our customers with their increasingly global requirements,” stated Gary Wojtaszek, president and CEO of CyrusOne. Napatech announced support for TRex on its FPGA-powered SmartNICs, enabling lossless, high-performance traffic generation at all speeds up to 100GigE. TRex is an open source traffic generator, widely deployed across industries to test, benchmark and debug networks. "When developing high-performance networking equipment, you constantly need the ability to generate traffic at ultra-high speeds over complex real-world traffic patterns. By running TRex on a Napatech SmartNIC, I now get all the features of TRex while having my own small high-performance system that can run independently from the existing setup," stated Michael Lilja, chief technology architect of Napatech. 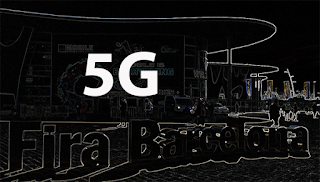 Swisscom and Ericsson are collaborating on end-to-end network slicing for critical communications in a joint project to deploy and explore new use cases for 4G and 5G. In mid-August 2015, Kenya’s Business Daily reported that following a dispute which had already gone on for three years Airtel Kenya had gone to the Kenyan High Court seeking to block another demand from the CA that it should pay $20.025 million spectrum fees before it could renew its operating licence. The dispute arose from the fact that in 2014 Essar’s YuMobile subsidiary in Kenya left the local mobile market and transferred its subscribers and licence to Airtel Kenya for about $6.9 million. According to Airtel, the CAK at that time promised to merge its operating licence with that of yuMobile, with the deal granting Airtel a lease to operate in the country until January 2025. However, subsequently under pressure from the Kenyan Treasury CAK had reneged on that agreement and come back to Airtel to demand KSh2 billion in licence fees. In late September 2017, following accusations by Raila Odinga that Safaricom had deliberately delayed results of the August 8th presidential election, the CAK national communication regulator denied that there had been any such failures of transmission by any of the Kenyan mobile operators. In late November 2017, DG Francis Wangusi of the CAK announced that following the failure of an earlier agreement between Kenyan operators to establish a common money transfer infrastructure by July 2017 the regulator now planned to make the interoperable wallet system mandatory in December 2017. On December 19th, 2017, Kenya’s Business Daily newspaper reported that the CA had announced that it was soliciting views from the general public on the minimum standards that should be set for internet devices. In mid-January 2018 it was announced that CAK DG Francis Wangusi had been sent on leave for three months with effect from January 12th while an independent audit is being carried out on the Authority’s “structure, promotions and training” following alleged claims of malpractice in those functions. This surprising and unexplained move has been interpreted by observers in many different ways. On January 23rd 2015 Wangusi was reappointed as CA DG for a second four year term but since then it seems that his relationships with the Kenyan Ministry of Communisations and the Kenyan government have deteriorated for several reasons. One reason may have been the fact that the CA had been unable to extract an additional licence fee of KSh 280 million from Airtel Kenya which was cash the Kenyan Treasury badly needed; secondly it was argued that the CA had awarded a license to Jamii Telecom to use some 700 MHz frequency far too cheaply and at a more questionable level had exercised extremely tight control on his resources refusing to fund some possibly boondoggle trips to symposia for some members of the Ministry. Number of mobile money subs: (mn).